LED tape light is a superbly attractive, stylish and modern lighting product that is safe to use and easy to install in any part of the home. Also suitable for office environments, retail outlets and bars, clubs and restaurants, this visually compelling lighting solution can be used to create a contemporary mood that is warm and relaxing, with even the smallest of budgets. At Fibre Optic FX Ltd, we offer an enormous choice of LED strip lights ranging from standard white, through to full colour, adjustable RGB and RGBW LED tape, which can be used to create a dynamic range of lighting effects such as bright task lighting, coloured mood lighting and accent lighting. One of the most common applications of LED tape is under cabinet lighting. Our LED strip lights can be conveniently cut to size and fitted in all manner of areas including above and beneath kitchen cabinets or bathroom units, behind or around the edges of wall-mounted TVs and mirrors, around skylights and under the staircase treads. LED tape lighting can also be used outside and it is particularly effective for illuminating roof lines, garden paths and walls, and also on stairways leading to and from the front or back door of the home. With such a vast range of colours, lengths and levels of brightness to choose from, both our indoor and outdoor LED strip lights offer a near endless list of possibilities and are also affordably priced. If you are looking to save money on LED tape lighting, then our low price, high quality LED strip light kits are the perfect choice. Supplied with a high quality self-adhesive backing, our 3M LED tape light can easily be cut to your precise measurements using a standard pair of scissors. 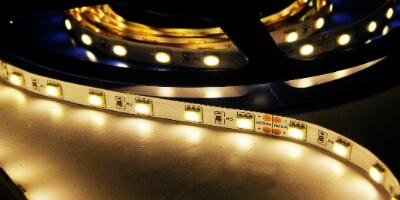 When choosing an LED tape light kit, the most basic option is the single colour LED strip. These are available in red, green and blue, along with standard white and additional colours such as pink and orange. Single colour strips are dimmable and this can be achieved by using a suitable driver or dimmer. If you are using a single colour 12v LED tape light then you will need to make sure you have an appropriate constant voltage driver in order to step the power supply down to the required 12/24 volt DC from you AC mains voltage. More powerful arrays will require a more powerful driver, so you must always make sure that your power supply has a high enough capacity for the task in hand. If you are new to LED lighting and you are struggling to find the right power supply or LED driver for your needs, then we always glad to offer practical help and advice so that you can get your new system up and running with the minimum of fuss.